The GOG.com and Steam versions have separate servers for online features (the Pawn system and Ur Dragon). Aspect ratios narrower than 16:9 are letterboxed. Use Agnostic Dragon to fix the UI/aspect ratio. Ranges from +0 to +15. Cheat Table also available. Use GeDoSaTo or dinput8.dll hooks. Frame rate is capped at 150 FPS. Rendered image uses SDR color space. In-game HDR option refers only to HDR Rendering. ↵ Enter and ← Backspace are reserved for menu navigation and cannot be bound to controls. No mouse acceleration. Mouse smoothing can not be turned off. Cannot scroll lists with a scroll wheel. Some nav elements are non-clickable. DirectInput only. For XInput 6 presets available. 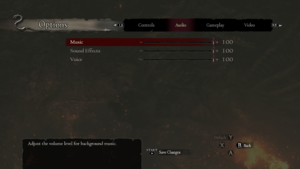 Use Dualshock Buttons for DDDA or DualShock 3 Buttons for Dragon's Dogma. 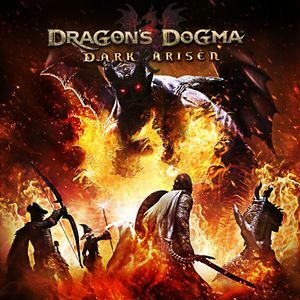 See Helix Mod: Dragons Dogma. Use surround sound, either natively or through software (Razer Surround works fine). Approximates surround sound without actual 5.1/7.1 hardware. Virtualization is limited to discrete positions. Requires headphones and 3rd-party software. Lacks low tone range without specialized headphones. Enabling Loudness Equalization under Enhancements in Speaker Properties alleviates this issue for users without headsets or users streaming through Steam Link. Requires no specific hardware or 3rd-party software. The volume contrast finesse will be lost. Far warcries, close explosions — all will sound blandly same. The thread at Steam Guides explains how it works and has a download link. Sound quality after the game loads user settings is untouched. Requires no specific hardware. Requires 3rd-party software tampering with the game itself. Some clipping on the title screen. Go to the configuration files location. May not be a desirable option for anyone wishing to play at a framerate higher than the console versions. XInput/DirectInput devices including Xbox 360, Xbox One, DualShock 4, Steam Controller and Logitech Controllers. Some high-end integrated graphics chips and modern gaming laptops with a discrete GPU may work but have not been tested, nor are they officially supported by Capcom. ↑ 1.0 1.1 File/folder structure within this directory reflects the path(s) listed for Windows and/or Steam game data (use Wine regedit to access Windows registry paths). Games with Steam Cloud support may store data in ~/.steam/steam/userdata/<user-id>/367500/ in addition to or instead of this directory. The app ID (367500) may differ in some cases. Treat backslashes as forward slashes. See the glossary page for details. This page was last edited on 7 April 2019, at 23:34.